Samaritans branches have different working patterns in order to give a 24 hour 365 day per year listening service. If you would like to volunteer as a listening volunteer in Leeds, please ask about our working patterns and find out what would be expected of you if you became a Listening Volunteer with us. The aim of Samaritans’ work with young people is: To raise awareness of the existence of Samaritans and what we do. To create an understanding of emotional health and its impact on the wellbeing of young people. To raise awareness of the importance of emotional support and where it can be found. To explain the value of listeningTo encourage young people to consider the possibility of calling. Samaritans if they are experiencing feelings of distress etc. As part of our committment to reducing suicide, we train prisoners in our local prison to provide emotional support to other prisoners by becoming 'Listeners'. The Listener Scheme celebrated its 25th anniversary in 2016. Please check our opening times for our Face to Face service in the Leeds branch. Samaritans of Leeds have been offering emotional support to people in the Leeds community for over 50 years. Samaritans provide confidential, non-judgemental support 24 hours a day for people who are experiencing feelings of distress or despair, including those which could lead to suicide. We have a team of around 120 dedicated volunteers who keep our branch phones answered 24/7, fundraise to keep the branch running and assist in our shop to bring in vital funds. We are always actively recruiting for more enthusiastic volunteers to join us! Volunteering for Samaritans gives you a real chance to make a difference to people's lives using existing skills or developing new ones with our training. 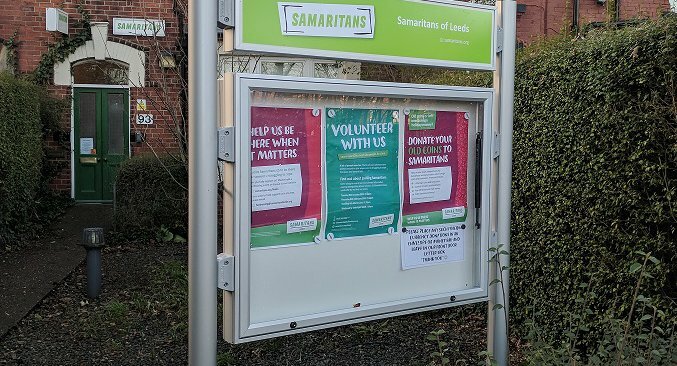 The Samaritans of Leeds offers a unique place to grow both personally and practically, in a supportive environment. Samaritans of Leeds is part of Samaritans, a charity registered in England and Wales (219432) and in Scotland (SC040604) and incorporated in England and Wales as a company limited by guarantee (757372).